Australian Employment: Another Reason to Sell the Aussie? We had quite a bit of a surprise yesterday, didn’t we? The Aussie rallied across the board after the RBA cut interest rates to record-lows at 2.50%. As I pointed out in yesterday’s Piponomics article, the rally could’ve been because investors were relieved that the RBA didn’t go all out and slash interest rates by 50 basis points. It might have also been a classic case of “buy the rumor, sell the news.” After all, RBA Governor Glenn Stevens‘ remarks last week about inflation gave investors ample time to price in further easing. In any case, the unexpected turn of events has prompted some to believe that the Aussie has bottomed out, at least for now. However, another market-moving report is just around the corner from the Land Down Under. With the release of the July 2013 Australian employment report set for tomorrow (Thursday, August 8, 2013, at 1:30 am GMT), it’s hard to say that the Aussie, in fact, has reached a bottom. The monthly report, which in the past has had a strong impact on Aussie trading, tends to have a direct correlation with the Aussie’s price action. Market watchers are predicting that 6,200 jobs were added during the month, lower than the 10,300 increase that we saw for June. Meanwhile, the unemployment rate is anticipated to come in higher at 5.8% from 5.7%. If the July employment report is anything like the job advertisements report, we could be in for a disappointment. Job ads fell for the fifth straight month in July, recording a 1.1% drop month-on-month, according to a study by ANZ. From the same time last year, this translates to a whopping 18.6% drop. From the looks of it, a trend seems to be developing in the Australian job market, and ANZ believes that the unemployment rate could continue rising this year. Heck, even the jobs that the economy has managed to produce haven’t really been impressive – majority of the jobs added in July are said to have been part-time jobs. With the resource investment boom finally dying down, hiring in the mining and construction industries has notably weakened. But this isn’t an isolated case – other sectors, such as property, manufacturing, financial services, and media, have experienced their fair share of job losses as well. Furthermore, it’s said that hiring hasn’t improved in Western Australia or Queensland since November 2012, when slowing demand from China pushed companies to hold back on employing new workers. 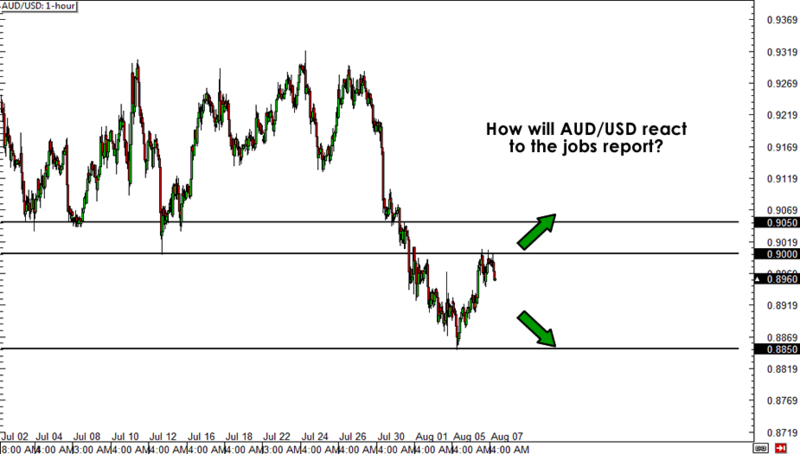 The way I see it, there are three possible ways the July employment report could play out on AUD/USD. If the results exceed expectations, it might cause price to break through key resistance levels, such as the .9000 major psychological handle or even the .9050 former support zone. If results fall within expectations, we could see AUD/USD zig and zag a bit, but ultimately, it will probably continue trading within the range of its current levels. Lastly, if the results fall below expectations, it could trigger a sell-off and push AUD/USD to revisit its recent lows around .8850 or even forge fresh lows, depending on how disappointing the results are. In your own opinion, what effect will the labor report have on the AUD?